In 1844, after being exiled to the island of Jejudo, the Korean painter and calligrapher Kim Jeonghui wrote a letter to his friend and interpreter Yi Sangyeok in order to thank him for the books he had sent him from Pekin. The letter, aside from some brief strokes that aspire at being ideograms, is a drawing of a house in the midst of winter, with two dry pines representing fortitude towards adversity. The drawing, done without any pretention of virtuosity, is a statement of principles, a philosophical and political legacy, a revolution through writing, calligraphy and drawing. It is also, let us not forget, an affirmation of love, friendship, and solidarity. 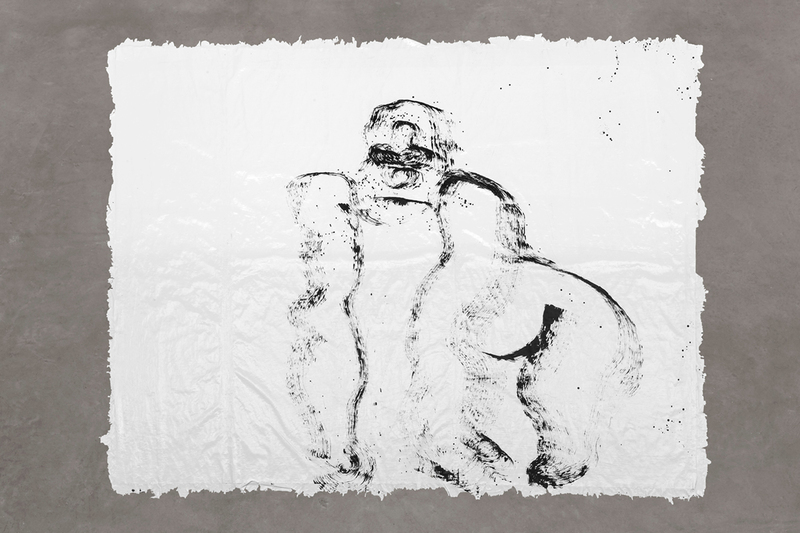 A couple of months ago, as I endured Berlin’s winter, I recovered a practice from years back: drawing primates with wall paint on Kraft paper painted white. I used to draw them with pens, with lots of detail and patience, then I moved to monoprints and now I do them hastily, elementally, almost as dancing over the enormous sheets of white-painted paper. I continued with the series after returning to Mexico in a large format that requires preparation time, printing the sheets with varnish paint layer after layer and then using the broom to draw on them, with the simple and unpolished gestures of our closest relatives. Once I read that gorillas are genetically closer to humans than zebras to horses; that is why I started portraying them. Then, as I did them, as a therapy or as some inefficient or meditative practice, I started discovering amazing similarities between cynocephaly, orangutans, guenus, giant baboons, catarrhinis and my own parents, brothers, aunts, grandparents, and cousins. My aunt Amalia was almost identical to a rhesus macaque and Rogelio, my father, was without a doubt the closest thing to a baboon. I sometimes dream I am a silver furred gorilla. Military governors from dictatorial and coup regimes were colloquially called gorillas, which is obviously a great injustice to the animals. In one of the front pages of El Diario de México dating from 1966, through an alleged printing error, the two captions from a picture of orangutans arriving at the Chapultepec zoo and a picture of a gas pumper convention presided by the infamous face of president Gustavo Días Ordaz (who the people had already nicknamed El Chango: The Ape) were switched. The newspaper was shut down by the government and El Chango continued being (as everybody knows) an oppressor. In Mexico, cartoonists are called moneros because they draw monitos (funny characters, literally “little monkeys”). Around one hundred years ago, a diner downtown renamed itself “Los Monotes” after the young artist José Clemente Orozco exhibited there his drawings done on cardboards which were large format cartoons, big monitos so to speak. At the time, Orozco had only had one formal exhibit, composed mainly of bitter cartoons about the revolution which had shaken the country for almost a decade, although some think it never ended. Besides representing the cruel destruction of war, Orozco also included drawings of prostitutes and urban characters similar to those of “Los Monotes” series. A couple of weeks ago I went back to Korea, where I recovered not only my love for calligraphy and drawing, but also the pride for my opposable thumbs and my humbleness in the face of the fierce and destructive nature that stirs within us. And although we continue living in a regime of repression and war, not just the war the government is supposed to be leading against drug traffickers and the uncontrollable sicarios, but a war of fear and a cornering of public society, I would like to recover for myself the pride in being an animal, a beast, or a monkey.